HOME » NEWS » ARTICLES » LEED®: Added Cost or Sound Investment? Probably the single biggest barrier to building green is the perceived added cost. Consider this: the added cost is about 0.04% of the total cost to build and operate a facility for 20 years. This tiny investment can produce great returns on the other 99.96%. Surveys of actual LEED® (Leadership in Energy and Environmental Design) projects indicate that most LEED® buildings “add” between 0.5% and 2% to construction costs. Considering the LEED® process can actually save money by reducing expensive change orders during the design and construction process, the “cost” may be even less. Initial land and construction costs account for only 2% of a 20-year life-cycle cost of a building. 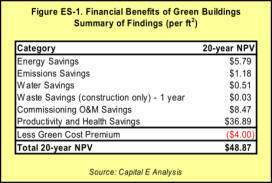 Combine a 2% green premium on 2% of the life cycle cost of a building, and LEED® costs a tiny, almost insignificant 0.04% of the life cycle cost of a building! The other 98% cost of owning a building for 20 years includes 6% for energy, operations and maintenance, and a whopping 92% for salaries. The tiny 0.04% investment will produce big returns on this 98% for the life of the building. LEED® integrates several valuable services and design features that directly benefit the owners “bottom line”. The bottom line could be higher profits, better patient care, higher test scores, lower energy and maintenance costs, higher employee retention, better recruiting leverage or more successful fund raising for non-profit organizations. Probably the greatest benefits of LEED® buildings are the positive effects on occupants. LEED® buildings provide better indoor air quality, thermal comfort and lighting, as well as a greater connection to the outdoors with more access to views outside and also greater use of natural daylight indoors. With 92% of a building's operating cost applied to human capital, clearly building design elements that improve occupant performance are a great investment and this is a huge part of LEED®'s return on investment. A survey from Capital E indicates that the higher $4 per square foot first cost saves $15 in operating costs and results in an overwhelming $35-$55 dollars per square foot of productivity improvement over a 20 year analysis period. The first “E” in LEED® represents energy efficiency. But not only are annual energy costs significantly lower than those for standard construction, so are maintenance costs because LEED® certification ensures the building and its systems are designed, constructed, and controlled as intended. The LEED® process provides maintenance procedures and owner's staff training that decreases lifetime operations and maintenance costs. Whether you are part of a for-profit corporation, small business, non-profit organization, school, health care facility or other institution, engaging in sustainable green design is good publicity and that is good for business. Publicity can help market your business, recruit students and staff, raise construction funds, and win grants and utility rebates. Does green cost “extra”? Initially, yes, but there are few features in your facility that can provide return on investment like LEED® can, and we haven't even discussed the environmental benefits yet!